Undergraduate marketing students at The University of New Mexico Anderson School of Management unveiled a new advertising campaign for the 2017 Acura ILX titled “Live Life in High Gear.” The campaign is part of the Acura ILX Marketing Challenge, an industry-education partnership program sponsored by Acura and managed by EdVenture Partners. The launch is supported by an integrated marketing campaign featuring branded events, digital signage, online video content and social media. The campaign was developed by the student-run advertising agency at UNM’s Johnson Marketing Lab using a $2,000 budget provided by Acura. “Live Life in High Gear” showcases Acura’s performance technologies and celebrates how millennials are living life to the fullest by pursuing their personal and professional passions. 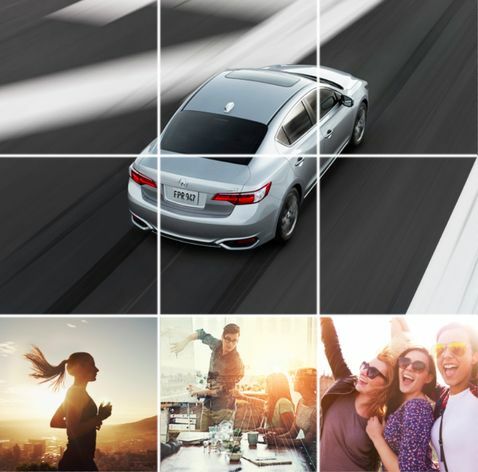 The objectives of the campaign are to educate consumers on the features and benefits of the 2017 Acura ILX, increase purchase consideration of the sport sedan among the millennial target market, and increase perception of Acura as an innovative, youthful brand. The campaign kicks off with the “Live Life in High Gear Event,” where attendees will be able to preview the 2017 ILX, test their skills on a ninja obstacle course, and participate in an interactive photo experience. The event will take place on Nov. 14 and 15 at Smith Plaza on the UNM main campus from 11:00 a.m. to 2:00 p.m. The ILX is Acura's most affordable sport sedan and serves as the gateway to the Acura lineup. The 2017 ILX features a 201 horsepower 2.4-liter direct-injected DOHC i-VTEC engine paired with an 8-speed dual clutch transmission with paddle-controlled Sequential Sport Shift, Jewel Eye® LED headlights, 17-inch alloy wheels, and signature Acura technologies such as the available AcuraWatch™ suite of safety and driver-assistive technologies. The top three participating schools in the Acura ILX Marketing Challenge will be invited to Torrance, California to present their campaigns to Acura executives and leadership. The top team will receive a scholarship prize of $5,000, followed by $3,000 for second place, and $1,000 for third. Consumer information about the Acura ILX is available at acura.com/ilx. Connect with the student campaign on Facebook, Twitter and Instagram using the hashtag #LiveInHighGear. Founded in 1947 and named for New Mexico oil man and longtime ARCO/Atlantic Richfield CEO Robert O. Anderson in 1974, the Anderson School offers more than a dozen concentrations at the BBA and MBA levels and is accredited by the Association to Advance Collegiate Schools of Business in the top 20% of business schools in the nation. The School is funded by the State of New Mexico and further support is generated by the Anderson School of Management Foundation. Acura is a leading automotive luxury nameplate that delivers Precision Crafted Performance, an original approach to technology and design that creates a new driving experience. On March 27, 2016, Acura celebrated the 30th anniversary of its launch as the first luxury nameplate from a Japanese automaker. Nearly 98 percent of the products Acura sold in America in 2015 were built in America, using domestic and globally sourced parts. The Acura lineup features five distinctive models – the RLX luxury flagship sedan, the TLX performance luxury sedan, the ILX sport sedan, the 5-passenger RDX luxury crossover SUV, and the seven-passenger Acura MDX, America's all-time best-selling three-row luxury SUV. This spring, Acura launched its next-generation, electrified NSX supercar as a new and pinnacle expression of Acura Precision Crafted Performance. For more information, visit acuranews.com. EdVenture Partners is an organization dedicated to developing innovative industry-education partnership programs. These experiential learning opportunities provide hands-on, real-world experience to students in tandem with providing marketing, recruiting and social impact solutions at colleges, universities and high schools to clients. EdVenture Partners has designed and managed programs at over 800 schools in North America and internationally. For more information, visit edventurepartners.com, Facebook, or LinkedIn. For more information about the Anderson School or the campaign, visit mgt.unm.edu, email info@mgt.unm.edu, or call (505) 277-6471.